The charter boat that takes guests up the gorge as well as providing a ferry service across the Katherine River. The family and I have just hiked the Jatbula trail again. The information in the article below is all still relevant with no significant changes to the track. We will add a video on this track find the link below. What is different or what did we do differently? This time we travelled from Darwin early in the morning (left Darwin at 4am) and arrived at Katherine Gorge just after 7:30am. We had a briefing with the park and got our permits signed prior to taking the ferry over the Katherine River at 9 am to commence our walk. The walk and the camps are all exactly as I remember it. No major changes. We spent more time exploring Biddlecombe Cascades and found a very picturesque waterfall below the cascades. New photos added. As well as additional photos from the other sites. The hike was done in five days (four nights). The most expensive part of the hike is the transport from Edith Falls back to Katherine Gorge. I would suggest that only one-person travel back and pick up the car for the rest of the group. This would be the first time these boys would take on a hike that was longer then an overnight stay. Five boys all aged around 10 years of age accompanied by four Dads all approaching – well lets just say they were a lot older then 10 years of age. This was to be a coming of age hike for the boys and the most important items to take along for them? A pocketknife and matches. For the Dad’s what did they consider important to take along, everything else you take on a six-day hike. The Jatbula Trail is located in Nitmiluk National Park (Katherine Gorge National park) just outside Katherine, Northern Territory, Australia. The trail is one of the more popular lengthy hikes in Australia. This coupled with a firm restriction on the number of hikers and the fact that it is only open in the dry season (winter months) makes booking in advance essential. 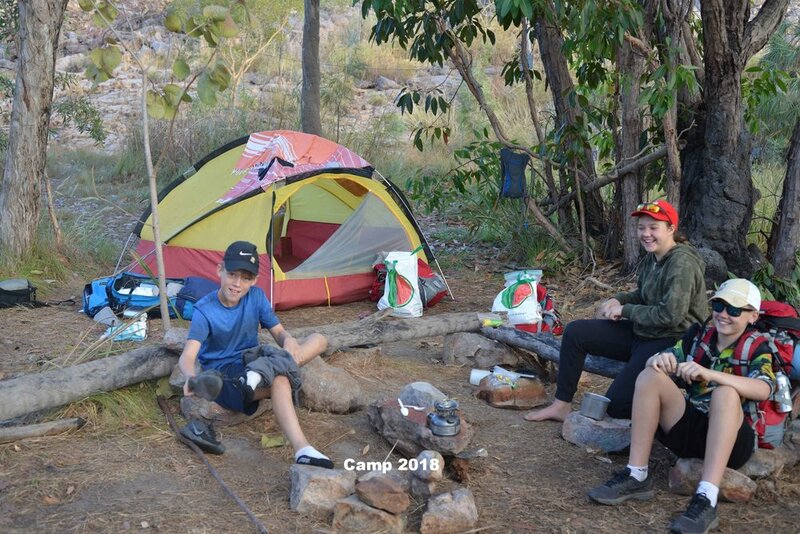 Hiking is done over six days, five nights and covers roughly 62km from Katherine Gorge to Edith Falls. Each day’s walk takes about 3 to 4 hours of comfortable walking. Getting to the campsites just after midday leaves a lot of time to go for a swim, to explore the area and relax (10 year olds don’t relax –by the way). The trail was named after Peter Jatbula a traditional owner of the land and a member of the Jawoyn people. 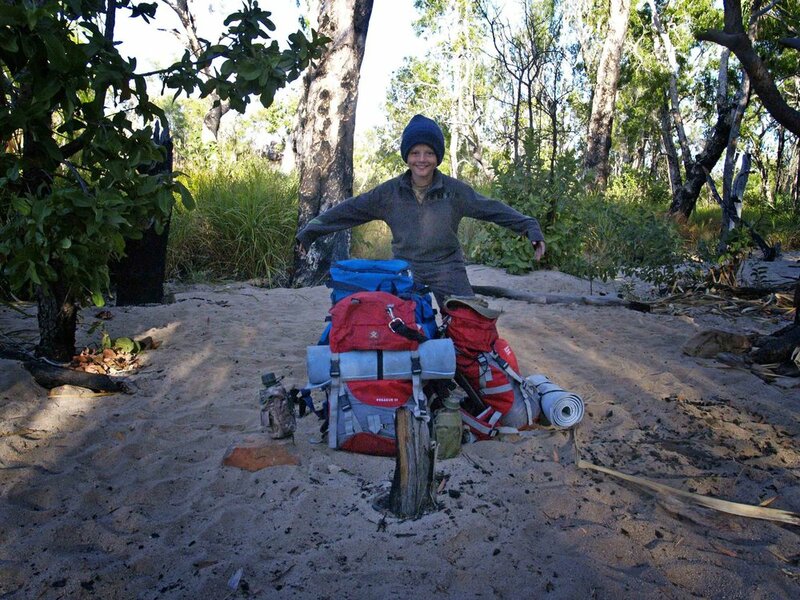 This trail follows the traditional route (used by the Jawoyn) along the western edge of the Arnhem Land Escarpment. Rock art at various sites along the trail bears testimony to long heritage of this walking trail. Good facilities at the start and end of the trail, a well marked trail, basic toilets at each campsite and a pristine environment are a testimony to the Jawoyn people and the Wildlife Commission working well together. Taking on the trail. Our plan was to arrive at Nitmiluk Park the day before the hike started. We all drove down from Darwin at different times with the last Dad and his son only leaving after work. 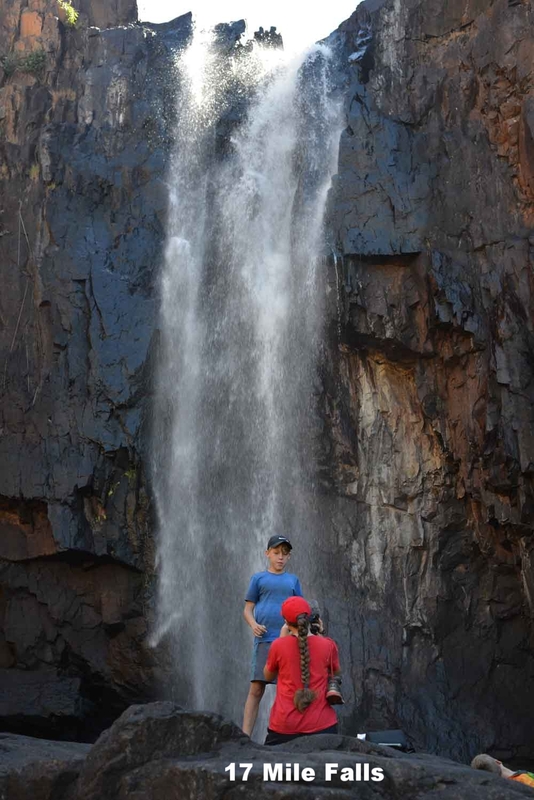 We booked through Nitmiluk Tours who operate the accommodation, gorge cruises, canoeing trips and helicopter flights at the gorge. We spent the night in the permanent tented accommodation. Nothing fancy but two single beds in a tent with linen and towels. It was however good value at $70 (2015) per person that included drinks and dinner worth $25 and breakfast in the morning worth $10. Dinner was served next to the pool in the caravan park with the kids from all over the park joining in to see who could get their paper plane to fly the furthest. Some of the diners may have got the odd paper plane in their wine but no one seemed to mind. The next morning over a breakfast of pancakes we heard the news that the last of our party narrowly missed hitting a water buffalo on the drive from Darwin. Not the sort of animal you wish to encounter at night. After breakfast we caught the charter boat that takes guests up the gorge. They provide a ferry service across the Katherine River. The boat was packed with American students getting the outback-Australian experience. The guide on the boat proceeded to inform them that we were about to embark on our 60km epic hike through the Australian outback. The boat landed with a smallish gap between bank and the boat. So I decided to take the first step on the edge of the river and not on the bank about half a meter above the river. This proved to be an embarrassing mistake. As my foot hit the sandy riverbed it disappeared into blue, tenacious mud. Luckily I had enough momentum to land with my other foot on the bank. Here I sat with my foot firmly stuck in the mud, the rest of me on the bank and 50 American spectators. Try as I may I could not get my foot out of the mud. I was stuck! Fortunately at that point my foot slipped out of my shoe and I was able to scramble up the bank in my sock. Taking my backpack of in order to extricate my shoe, with a life of its own it proceeded to roll down the bank towards my entrapped shoe. At this point my luck changed and I was able to grab onto the bag, once it was secured I managed to rescue my entrapped shoe. And so our journey began. Northern Rockhole and waterfall provide a great spot for a break and a swim. The first day of our hike was to take us from the Katherine River to Biddlecombe Cascades a distance of 8.3km. The walk follows a path between the foot of the escarpment and runs parallel to 17 Mile Creek. After about an hour of walking (3.8 km) Northern Rockhole and waterfall provide a great spot for a break and a swim. No water was flowing over the falls on our hike (mid July 2015) the pool was stagnant but water looked fairly clear and inviting. We all took a dip, had a bite to eat and then moved on. The path then takes a slow climb of about 100m over the next 4.5 km as you ascend the escarpment. This is a fairly easy walk with the only disappointment being that you follow a car track for a large section. After one and half to two hours of walking Biddlecombe Cascades provides the perfect spot to stop and relax. Biddlecombe Cascades is about as stunning as they come. Two streams of clear water come together above the cascades to ensure a strong flow of water over the cascade and into a deep pool at its base. From the base of the cascades the water flows over a waterfall (+/_ 5 to 10 meters high) and down the edge of the escarpment. The afternoon was spent relaxing in the pools by the Dad’s and every pool and rock was explored by the kids. As evening approached the mozzie domes, sleeping gear and camp stoves came out. As the likelihood of rain in the dry season is negligible most of us did not bother to even pack a flysheet. Water was collected from the stream and our food was rehydrated and served. No fires are allowed on the trail and all cooking has to be done on stoves. After dinner most of us Dad’s were ready for bed, not the 10 year olds however. They spent the next 2 hours running around in the bush with torches looking for cane toads before bedding down for the night. A fine choir of bird songs announced morning. A leisurely breakfast and an unpractised packing away of our gear saw us leave between nine and ten am. Well after the other two couples that were on the trail had packed up and departed. Our second day was to take us from Jatbula Trail to crystal falls (11 km). The kids took the lead and managed to easily follow the well-marked trial. The trial undulates over some rocky dry riverbed terrain, grassy pains and occasional riverine forest. On the way you get your first rock wall of aboriginal art and some great panoramas from the top of the escarpment. Again an easy four hours of walking will see you arriving at crystal falls. Crystal falls WOW! This swamp fed falls lives up to its name the water is crystal clear. Large pools that are 20 to 30m wide and at least that long with “crystal“ clear water making the detail at the bottom of the 5m pools easily discernable. These pools flow into a wide river with rocks, rapids and deep pools for the next few hundred meters before plunging over the edge of the escarpment. Crystal falls are rather secretive and getting a good viewing of the falls borders on the impossible. The falls tumble down into a narrow gorge with the gorge running at ninety degrees to the falls this scenario limits the ability to view the falls. The campsite is located next to the river under large shady trees. The afternoon was spent swimming, jumping of large rocks into deep pools and exploring the area. 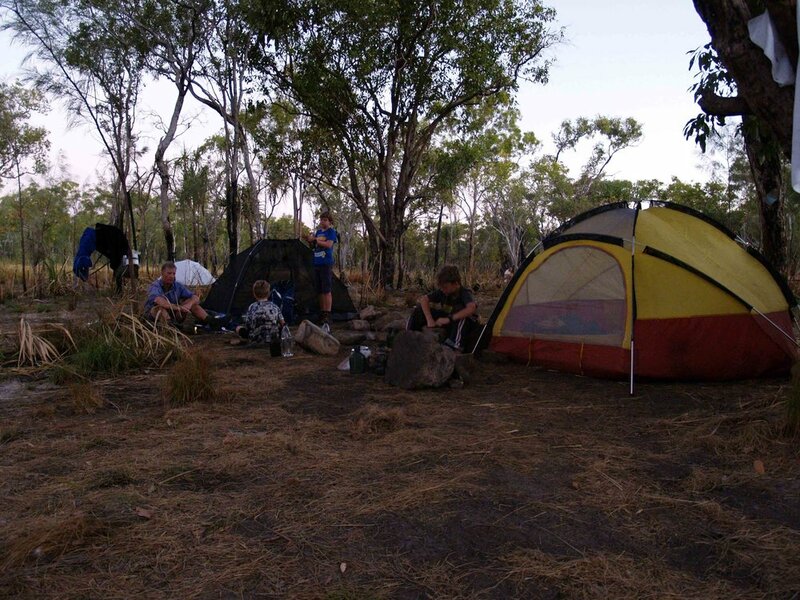 After dinner the boys donned their headlamps and were out to find cane toads again. However no toads were found but instead hundreds of little reflections could be seen in the shallow water surrounding the rapids. For the next hour the boys and Dads were kept buys trying to catch the little shrimps whose eyes were responsible for the reflections in the water. Crystal falls are rather secretive and getting a good viewing of the falls borders on the impossible. The Amphitheaters sheer cliff walls with roots hanging down, long tree trunks reaching up to the light and waterfalls trickling down all made for a good spot to explore. The last 10 meters to 17 Mile Falls campsite however has deep, soft, soggy, swampy soil that sees your boots disappear to ankle height in brown ooz. What a great place, deep green pools, at the base of the impressive 17 Mile water falls with shady trees on the far bank. After a good breakfast we set of with boots in hand to facilitate the river crossing and get day three of our hike underway. A 10 km hike from Crystal Fall to 17 Mile Falls. Shortly after starting the hike you get the best view of Crystal fall and the narrow gorge that it descends into. The hike then ascends up to its highest section at about 300m and meanders along very close to the edge of the escarpment. This provides occasional glimpses of the panorama below. After an hour and a half of walking (6.5 km) the Amphitheatre is reached. We stopped for snacks and a drinks before climbing down the conveniently supplied stairs into the canyon. The canyon has shear cliff walls with recesses and caves that provide the perfect accommodation and canvas for aboriginals and their art. The rock art is well preserved with an information board explaining the significance. The adults spent some time reading up on and admiring the paintings while the kids disappeared into the monsoon rainforest to explore. Sheer cliff walls with roots hanging down, long tree trunks reaching up to the light and waterfalls trickling down all made for a good spot to explore. On returning back to the top of the canyon we found that a thief had been into our unattended backpacks. Yes! A thief in this desolate, remote area had made off with the remains of our lunch. No more snacks for the rest of the day for some of us but we did pass some very large and satisfied looking black crows. We donned our packs and within and hour (3,5 km) found ourselves within sight of our overnight destination. As you approach 17 Mile falls you area rewarded with a great vista of the surrounding area and the falls plummeting over the rocky outcrop. Five minutes later and with the campsite in sight, the last obstacle. You cross over 17 Mile creek and walk along the bank of the river to the campsite. The last 10 meters however has deep, soft, soggy, swampy soil that sees your boots disappear to ankle in brown ooz. 17 Mile falls campsite is on a flat section of rock very near the top of the falls. The stream above the falls is a rather narrow, clear stream of water. The water forms several shallow wast deep pools with a sandy floor that feeds into a rocky cascade and then tumbles over the precipice as 17 Mile falls. The water has carved out deep and some very large perfectly round holes in the cascade. Of all the overnight spots I felt this was a nice spot but not in the same league as the others. The boys soon tired of the river that did not offer a lot to explore and spent most of the time in the campsite comparing pocketknives and shaping walking sticks. I took an afternoon nap. Late in the afternoon I decided to try and get some photos of the falls and together with the boys we wondered along the northern side of the escarpment. The view of the falls improved and as we tried to get a better view of the falls we found a path that led down the steep cliff area to the base of the falls. What a great place, deep green pools, at the base of the impressive 17 Mile water falls with shady trees on the far bank. You can get to the base of the falls and standing under the falls you can have your own natural shower. Unfortunately we left this exploration till late in the afternoon and in order to avoid walking back in the dark we headed back to camp. Getting to the base of the falls changes this camp from a mediocre site to an exceptional overnight stop. I just wish we had explored and found the track down to the base of the falls earlier in the day. That night around the camp the boys invited the couple sharing the track with us over for a chat. They were both medical students up from Melbourne for winter vacations. 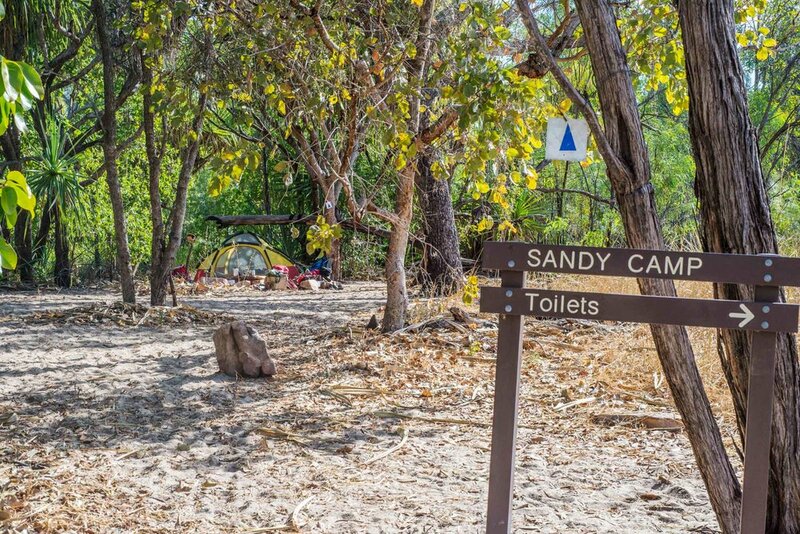 Sandy camp, as its name suggests, is situated on a sandy beach under tall Paper Bark trees nestled alongside a huge billabong (pond). Day five dawned with cold weather the net result being a tendency to linger in the sleeping bags a little longer. Emerging from the tents in warm clothing. The next morning we were up and on our way early as this was to be our longest day of hiking. 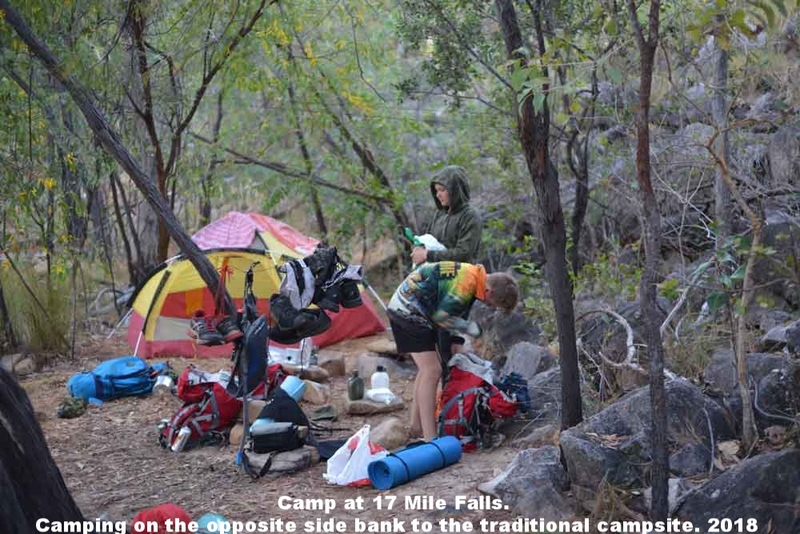 The walk from 17 Miles falls to Sandy camp is close to 17 km. Us dads were concerned about the distance and the ability of the kids over such a distance. The kids were aware of the distance and taking the lead they put on a cracking pace. We did at least 5 km in the first hour and the kids never looked back after that. The heavier hikers were showing some strain with the occasional blister making its presence felt. Our routine had become one of hiking for an hour, a short rest and then to repeat the process till we reached camp. We found this gave the kids ample time to rest and kept the group in contact with one another while still allowing everyone the freedom to maintain their own pace. We made excellent time and passed our fellow hikers having a long lunch at Edith River Crossing. In all honesty we probably pushed to hard on this section and did not get to enjoy the surroundings as much as we could have. 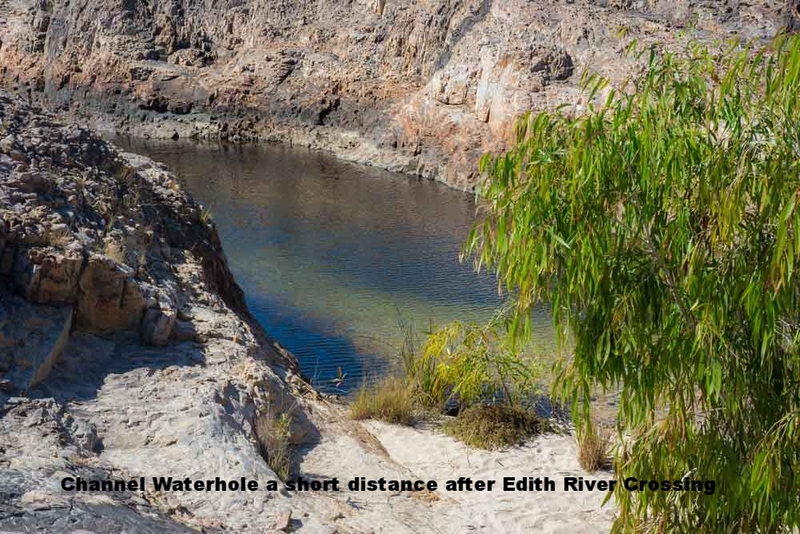 This is especially true for the last section before Edith Crossing and extending to Sandy camp were the track follows the Edith River. This section is often under shady trees with lily-covered ponds. We had a long lunch break under these shady trees and within a half hour found ourselves at Sandy Camp. Sandy camp is most defiantly the most picturesque of the overnight stops. 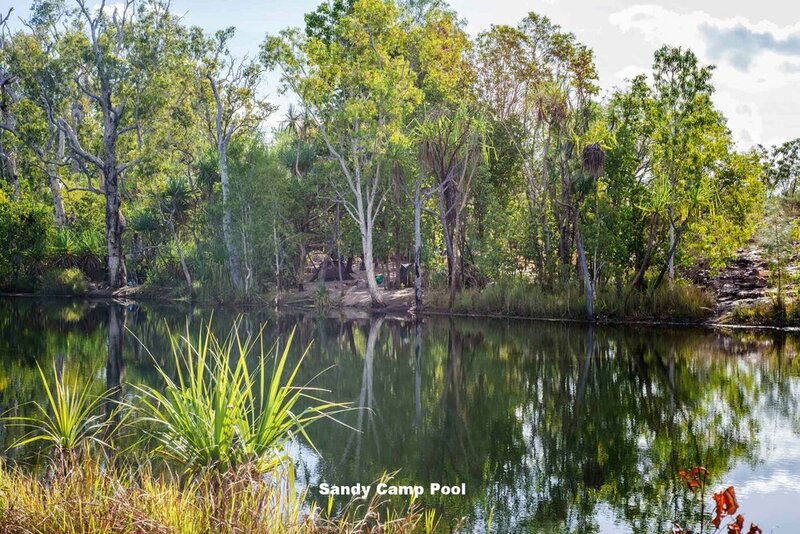 Sandy camp, as its name suggests, is situated on a sandy beach under tall Paper Bark trees nestled alongside a huge billabong (pond). The water is clear, cool and inviting. Fresh water was still running into the billabong providing us with good drinking water. The Dads all had a good swim the kids refrained. The temperature had dropped and was probably twenty-five degrees. This is a great temperature for most people in the world but for kids that have grown up in Darwin, this was cold. Not swimming weather. The afternoon was spent lounging about in the shade with the kids building a stone fort on a small hilly outcrop. They were soon distracted and abandoned the fort for the next adventure. As the sun began to descend were treated to a spectacular sunset reflected in Sandy Camp Billabong. That night was spent recalling iconic Australian films and scenes from the movies with “The Castle “ taking the lion’s share. Day five dawned with cold weather the result being a tendency to linger in the sleeping bags a little longer. Emerging from the tents in warm clothing we gathered in the sun for an early morning coffee and breakfast. The day would see us take the decision to press on and complete the hike. The colder weather made for great hiking conditions but less inclination to use the swimming holes that form and integral part of the experience. The lack of a fluffy pillow, a 1-inch sleeping mat and a few other minor inconveniences may have also contributed to the adult population pushing for this option. 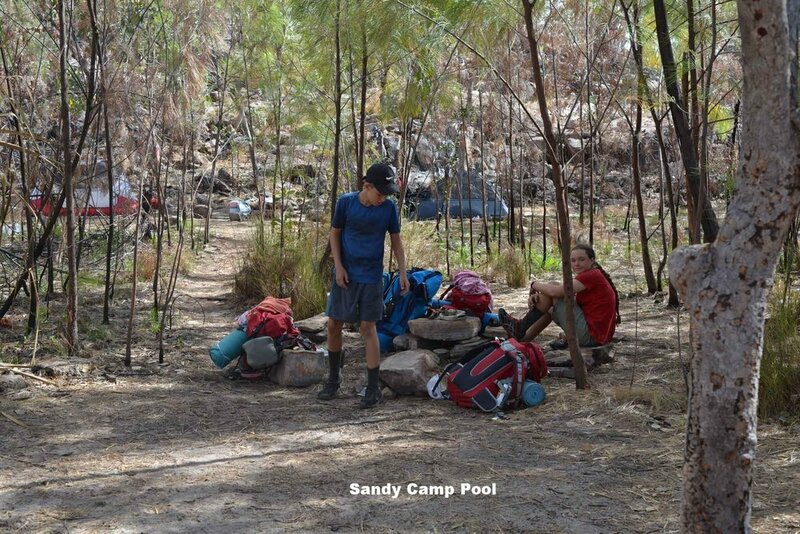 The section from Sandy Camp to Sweetwater Pool is about 11 km and would normally be the overnight camp for day five. 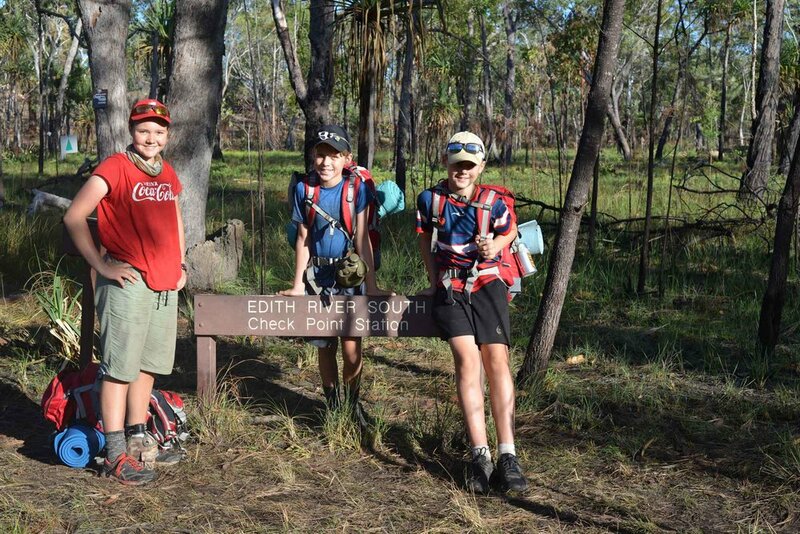 Our decision to finish the hike on day five meant we would cover 16 km to Edith Falls. This section of the trail follows the Edith River all the way from Sandy Camp to Edith Falls. The track is mostly flat and easygoing. Emerging at Sweetwater pools we encountered the first people we had seen in five days. 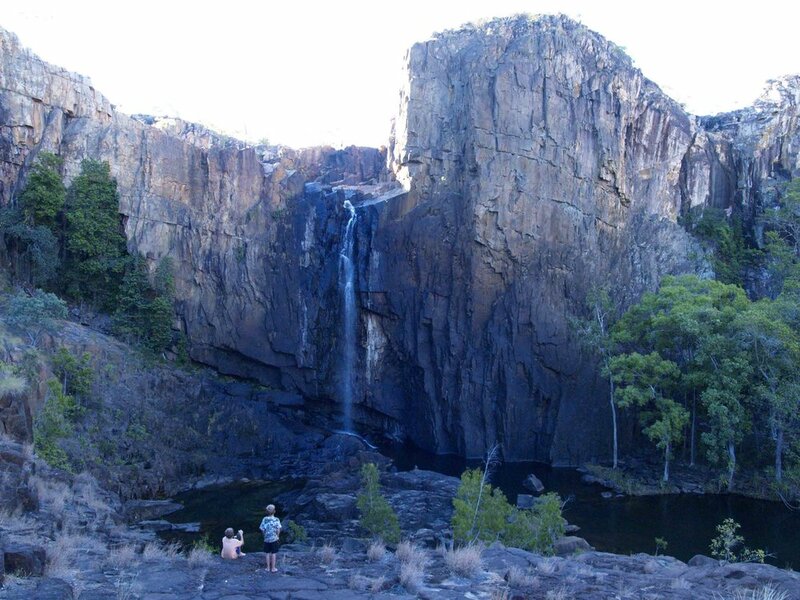 Sweetwater Pool is a popular hike from Edith Falls. The cold weather found only the dad’s taking a chilly but refreshing swim. We had a light lunch and then pressed on to reach Edith Falls by about 2pm. A cold Coke and some ice creams from the shop at Edith Falls rounded of a great hike. Sandy camp is most defiantly the most picturesque of the overnight stops. Why would I Hike Jatbula Traill? In closing my thoughts. My overall impression is that this is an exceptional hike. It provides a moderate challenge that is however difficult enough to leave you with a sense of accomplishment. The three to four hours of hike per day provide the opportunity to experience riverine forest, monsoon rainforest, open forest, woodlands and plateau scrub. 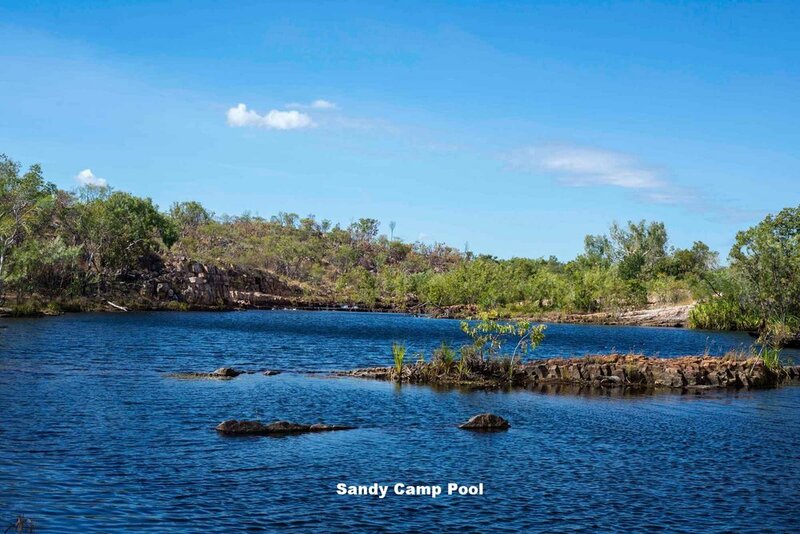 This is all randomly interspersed with aboriginal rock art, stunning vistas from the edge of the Arnhem Land Escarpment and occasional swimming holes. It all makes for an interesting journey and the opportunity to stop and enjoy the surroundings. 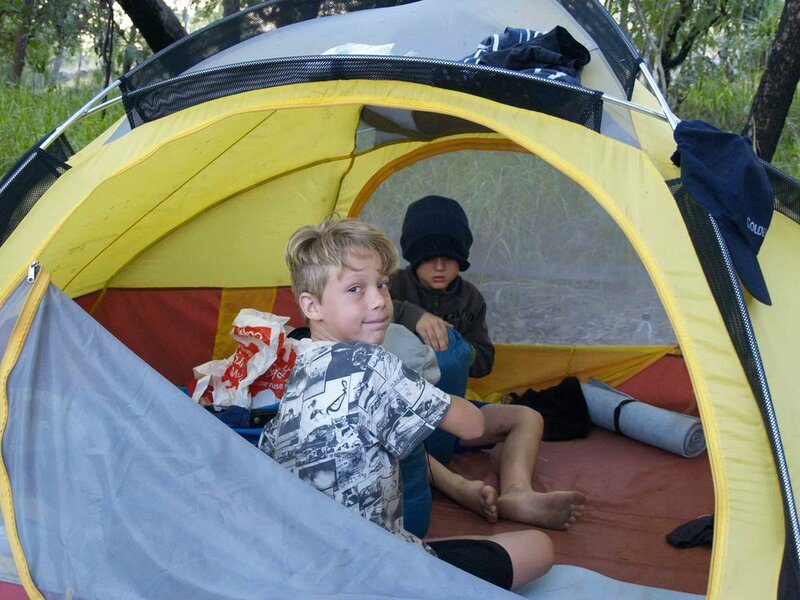 The short distances each day mean that you have a lot of time to enjoy each campsite. The highlight of this hike has to be the overnight campsites. Wether by design or by shear luck each campsite is truly unique. You may imagine that each site is just a camp area next to the same sort of river as the previous camp. Nothing could be further from the truth. Get out on the trail and take the time to experience and explore the unique environment that each site is situated in. It is well worth the time and effort. What do I regret on the trail. A campfire at night, nothing quite ends the day like a good campfire. The allure to congregate around its mesmerising flames, to share stories, to meet fellow hikers and just warm your toes. I will also take a slower pace next time (defiantly will be a next time). Take more time to explore and enjoy what is on the trail. Being men we were probably to goal orientated and getting to the campsite became more the priority then the journey. Now that I know that the hike is only about 3 hours per day more time can be spent exploring the trail. Take your time on the hike enjoy all it has to offer even at a leisurely pace you will still have plenty of time at the campsites. Once at the campsites get out and explore the surrounds, you never know what you may discover.